Violinist/vocalist Xani Kolac and drummer Mark Leahy of Melbourne’s The Twoks are back with an uplifting EP, “First Light,” which they recorded at Sydney 301 with “sweet vintage amps, toy pianos,” along with producer Tony Buchen. The title track will have you up on the roof with Kolac dancing to the sound of better times rolling in. I spoke with Kolac two years ago when The Twoks had just put out “Making Holes” and it was a pleasure to chat again about music transcending perceptions, permission to play, being compared to The Edge, and belonging. “First Light” is so full of percussive syncopation — especially on “Step Slide” — that I ask if Kolac and Leahy grew up banging on the pots and pans. Kolac shares some optimism about women in the music world. Being an independent musician has its downside, but focusing on connection keeps Kolac’s signature ebullience at the fore. You will not regret listening to “First Light” at https://soundcloud.com/thetwoks/sets/first-light-ep and then heading to see The Twoks at the next possible opportunity. ALWAYS a pleasure having Xani & Mark (The Twoks) playing at our small live music venue at the OnTop Bar in Ormond. They both put on a show for us as if it were in front of thousands of people. Their energy and talentis nothing short of fantastic! I for one will always support the Twoks and only wish them all the best in their chosen career. 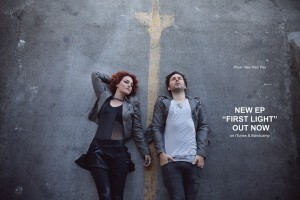 This entry was posted in Arts, Featured, Music and tagged band, First Light, indie, music, Review, the twoks, xani kolac. Bookmark the permalink.